Where To Be Happiest — Ginger writes. I have been waiting to see the first skiers on the lake this year, and yesterday was the day. After a week of 70+ degree weather, I wasn't much surprised. I know the water is still cold, but the warm air and sunshine make it more than bearable. It feels like spring is here. And on the first ski day, a chicken had to go and die. For the first time a week ago, we were so happy to get six eggs on a single day, one from each of our chickens. I did not expect it to be a once-only occurrence. But Sparkles, our Buff Orpington, was found dead in the coop yesterday. There was no blood or outward signs of attack, and the other chickens are fine, so we are not sure what happened. Bauer suspects a broken neck, and he would be most likely to know as he was the one who went out there and "took care of it." The news came as I was spilling pasta water on the floor while making Tofu Pasta for dinner, so Bauer did what Bauer is known to do: he handled it and handled it well. Thank you, Lord, for twelve-year old boys, for the chickens that remain, and for weather that beckons waterskiers. Which is why we have decided to let Story take dance. This is the girl who a year ago would not be seen in a dress and wanted nothing to do with whatever she deemed "girly." Now she asks almost daily if she can take ballet. And yes, she is aware that this includes putting on tights and a leotard. Thanks to a generous offer from my friend Sarah to help with carpooling, and the fact that Cash's soccer is already interrupting our regularly scheduled family dinner on that day each week, we are opening our hearts to our kids' hearts and hoping to give them the confidence that comes with memories and skill. Story's joy is becoming my joy in the matter. Sailor only needs a bin of shoes or clothes to bring heaven down to earth. Have I told you she changes clothes at least ten times a day? Every day. 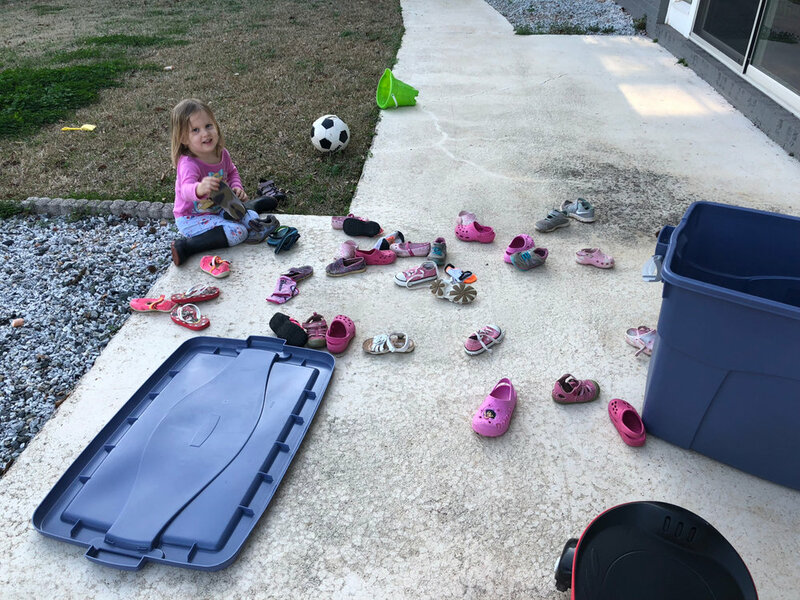 She begged both me and TJ relentlessly for a couple days straight last week to get out some old shoes she remembered having, until I finally broke down and dragged out the bin from the garage and let her have at it. It provided an hour of entertainment that night before dinner, which was totally worth the five minutes and muscle power it took. Even if it means I now have to pick up twice as many shoes in the house from the ones she brought in to "keep." Thank you God for avocados, the desire to try new things, and the entertainment of shoes. After a series of contemplative and reflective blog posts lately, it's fun to write a post that seems a little more inconsequential. 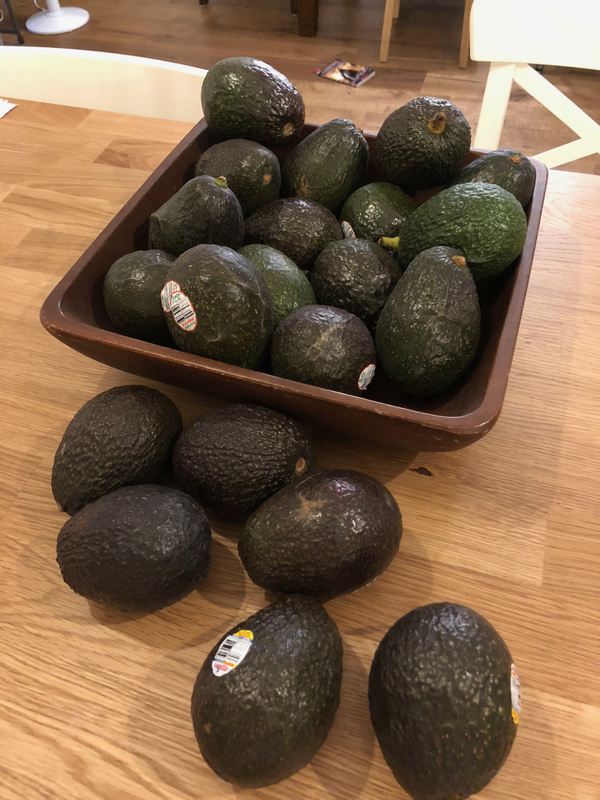 Yes, we eat avocados. Yes, our chicken died. Yes, we have a "ballet-er," as Sailor says when she sees someone dancing. And yes, I did spend $6.35 to buy a People magazine at Publix yesterday. I rarely spend money on the frivolities of life such as this, but occasionally when I can follow through on a desire for something spontaneous, or superficial, it feels good to not take myself so seriously. I know Anne Lamott would be proud. Even if I can't take a day off and do all that, I still took joy, at the end of a long homeschool Friday, to read about Jennifer Aniston and what went wrong. What went right is that I found a way to tend my emotional acre and I didn't feel bad about it. You should try it. Life is full of ups and downs for all of us, Jennifer Aniston included. Bauer has had a cough for days, but he's been reading new books from the library that he loves. TJ's car A/C went out, but he had to spend very little on car repairs all of last year. Sailor was grumpy, but Sailor took a nap. And she'll probably be grumpy again before bedtime, and so might any one of us. The good news is that we get to be grumpy sometimes, then back to kind, then tired from watching Olympics too late, then restored from a run that's perfect, then frazzled from a day of too many kids and too much noise, then grateful for church and time to reset and be with friends tomorrow. Thank you, God, for People magazine, for library books, and for life that is one big variety show. Even the wind can't get on my nerves today because I am so glad I'm here for the miracle.